If someone offered to put something in your house that might save your family’s life at some point over the next 10 years… and do it for free, would you take advantage of it? When Gretchen Atkinson, chairman of Shoreline’s Meridian Park Neighborhood Association, learned about how people could get free smoke alarms installed through the American Red Cross Home Fire Campaign, she took it upon herself to make sure people in her community had a chance to sign up. Her community mobilization generated a huge response. People are often surprised to learn that the installations are free, she said. 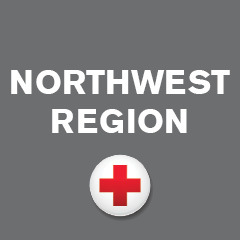 Like many of the other people who volunteer with the smoke alarm installations, Thiel has also volunteered on the Red Cross Disaster Action Team, which offers support to people after residential fires. She knows the difference a smoke alarm can make. Many of the people receiving this valuable service are elderly, or in poor health and may not have the physical ability to install smoke alarms, or even change the batteries. Thiel said people are incredibly thankful to see the Red Cross volunteers, who are often accompanied by local firefighters. One father, who recently moved with his family from China, kept thanking them as they installed new alarms. He made a point of contacting the Red Cross again afterward to express his gratitude. Another man, whose mother is disabled and living alone, contacted Thiel after the install to thank the Red Cross for giving him some peace of mind. The Shoreline Fire Department is also grateful the Red Cross is funding the purchase of the smoke alarms with long-life 10-year batteries. “It’s such a huge deal knowing how much smoke alarms save lives,” said Michelle Pidduck, Public Information and Public Education Officer for the Shoreline Fire Department. As a firefighter and EMT, she knows firsthand the value of working alarms. For many of the fire calls they respond to, they find there are no batteries in the smoke alarms because they’re located in the wrong place and trigger a false alarm when people cook. Or, there aren’t any in the first place. National Fire Safety Month is in October, so it’s a good time to reach out to the Red Cross about promoting a smoke alarm install campaign in your neighborhood. You can also volunteer to install smoke alarms during the national Sound the Alarm campaign Sept. 23-Oct. 15.